Our modest artists’ books series continues, here with a contribution by Peter Hobbs. A recent graduate of York’s Faculty of Environmental Studies doctoral program, Peter brings the story of petrocapitalism from southern Ontario to the fore in a graphic novel/comic book telling of the emissions of Chemical valley. Chemical Valley is a central hub in the combine flow of crude oil from the Alberta tar sands, the production of petrochemicals, the the production and dissemination of ambient toxins, and the flow of neoliberal capital. Central to the toxic story of Chemical Valley is the fact that the First Nation Aamjiwnaang is literally surrounded by giant petrochemical plants: exposing the Chippewa community to a constant barrage of airborne and waterborne emissions. 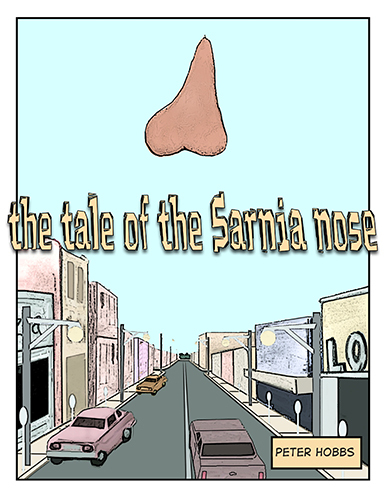 The Tale of the Sarnia Nose traces some of the region’s contradictory politics, history, desires, anxieties, and economics that buttresses Chemical Valley and allows for the slow and constant poisoning of Aamjiwnaang. The story attempts to map how this glaring example of an institutionalized colonial violence has become normalized: seen as a matter of fact rather than a matter of concern.